This was a productive weekend. We had no real commitments so we accomplished a lot. I don’t want to brag about all my recent accomplishments, so I’m going to share some embarrassing confessions too. Those books I was supposed to get rid of in March? To donate to a library in a neighboring town twenty minutes away? I finally took them on Saturday. Something came up back then, though I don’t remember what. I was out doing a couple errands on Saturday and realized I just needed to stop dreading the ride, which isn’t that bad anyway, and just do it. I needed to empty the back of the car so I could make a warehouse store run. When you read a simple living blog, the last thing you expect is for the writer to be a warehouse store shopper. After all, there is nothing simple about buying thirty-six rolls of toilet paper or a four-pound bag of lettuce. I only go once every few months, to stock up on necessities like coffee, laundry detergent and pet food. Trying to store everything is obviously a pain and a challenge, but I always figure it out. Since I live in an area which offers few close retail options, having enough of our basic staples to last a while means fewer trips to the store. I don’t know if I really save money, but I definitely save time which is almost as important. Most weekends, I don’t rush to get out of my pajamas. Sometimes I’m still wearing them at noon. I like to stay in bed, drink my coffee and watch Flea Market Flip or whatever else is on HGTV. But we had tickets for a pancake breakfast fundraiser so we were up and out of the house by 8:15. After the breakfast we went to a plant sale, and the rest of the day was so productive that I decided to try and get up early at least one weekend day. For all the time we spent getting to know Pixie, we neglected to ask one very important question: Is she housebroken? Hooray for warehouse stores and twelve-packs of paper towels. On Sunday I went into the garage and threw away some old cans and some other junk the previous owners left behind. Since we’ve been in the house for ten years I figured it was time. I emptied the car of books and filled it with stuff I didn’t want anymore, and dropped it all at Goodwill yesterday prior to my warehouse visit. 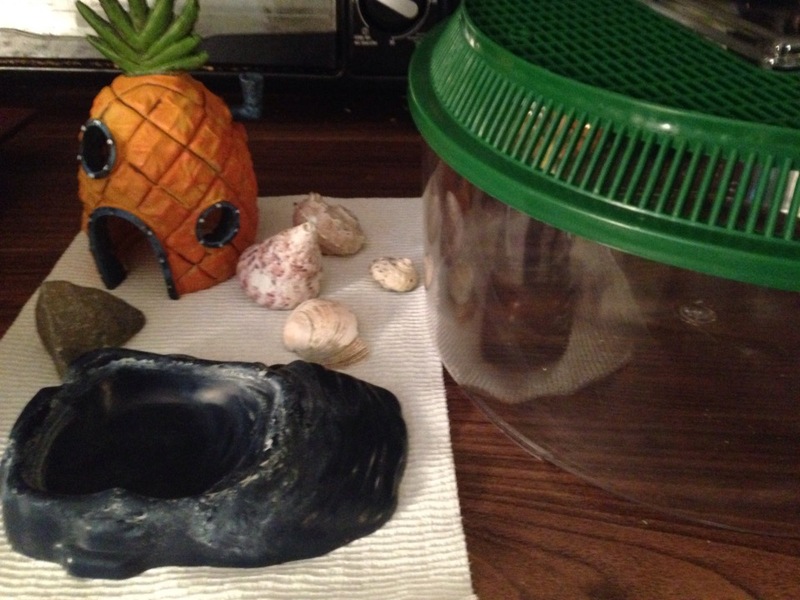 Our hermit crab, Mr. Pincers, bit the dust recently, and normally I would have stored his container even though we have no plans to get another crab. But Bob cleaned everything and I added to the Goodwill pile. There were numerous tag sales- big ones- in the area this weekend. I couldn’t turn my head or look at Facebook without seeing some kind of advertisement. 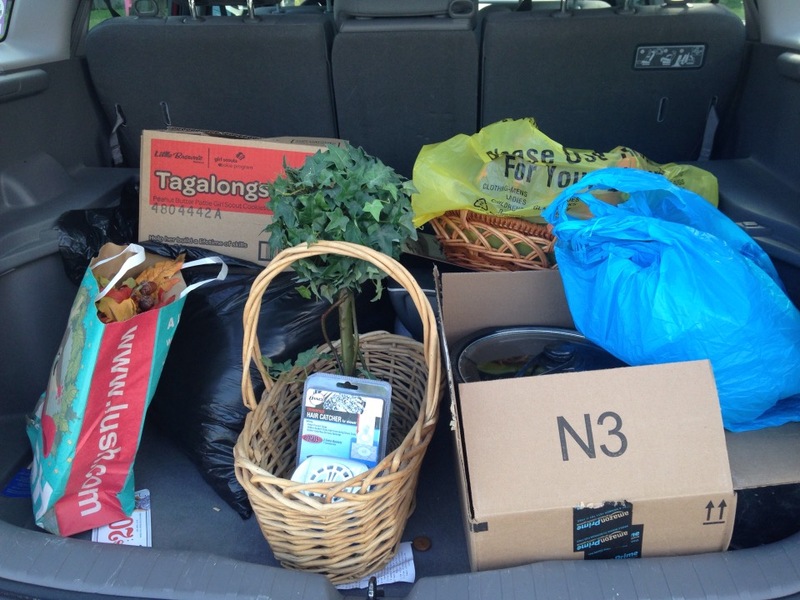 On Friday I saw my neighbor loading her car with things to sell, and felt equal parts motivated to both purge and shop. But I stayed away from all of them. Our neighborhood is also gearing up for its annual bulk garbage day, when we can throw out things the garbage collectors won’t otherwise take. Some people, me included, put out things that are in decent shape because others drive around looking for things to salvage. I found my entry way table last year just before another street’s bulk pick-up day. I drove by some nice kitchen chairs and was tempted to stop, but didn’t. Bob and I made a big dent in the garage over the weekend. We put out some bulk items, including a few things we hope people will take before Wednesday, otherwise we’ll drag them back to the house to post on Freecycle. There’s still a lot to do but we see the difference. I donated a few big baskets, fake plants and a few other knick-knacks which had been sitting out there, and made a ‘think about’ shelf which I will revisit in a week and make a final decision. I think you’re title is misleading. I see everything in this article as a victory! You achieved a lot this weekend (I wish I could say the same). Stay strong – those yard sales are just gearing up and RIP Mr. Pincers. May another crab enjoy your pineapple house. you’re = your. I hate it when I notice my grammar mistakes after hitting enter. Sorry everyone! Remember everyone has a different way of simple living. Don’t compare to others. I used to love antiquing but since I decided to simplify I dont do any shopping of that kind. Its easy to pick up cool treasures that have no purpose. Thx for sharing. great progress! good for you for getting rid of crab stuff. It sounds like you made great progress. As a note, I think buying in bulk can be a great way of simplifying if it saves you time and trips, at least if you’re certain you’ll use everything that you purchase. Don’t feel bad about your bulk store shopping! I too go once every few months for a big load of things like tp- but I also stock up on basics like flour, rice, meat, cheese…I’m not buying monster freezer packs of egg rolls or beautiful books (so, so tempting though to me!) so I feel pretty good about it.